White tigers are very rarely found in the wild. In about 100 yeas only 12 white tigers have been seen in the wild in India. They are almost extinct and most of the ones living are in captivity, mostly in zoos. This specific tiger is neither an albino nor a seperate subspecies of the tiger. The white tiger (also known as the Bengal tiger) is about 3 meters long, and weighs approximately 180-285 kg (400-569 LB). It’s coat lies flatter than that of the Siberian tiger, the tawny color is richer and the stripes are darker. They have blue eyes, a pink nose, and creamy white fur covered with chocolate colored stripes. White tigers are born to tigers that carry the unusual gene needed for white coloring. The white tiger is born to a bengal tiger that has the gene needed for white coloring. Wild white tigers are rare species. A pure white tiger has no stripes and are totally white. They are usually located on the Mainland of Southeastern Asia and in central and southern India. Those living on islands have almost disappeared, most now live in zoos or special wildlife parks. Even though it is illegal, white tigers are hunted by poachers in many Asian countries. 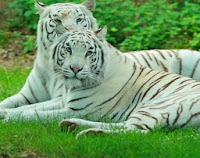 · White tigers are born to Bengal tigers that carry an unusual gene needed for white coloring. The White Tiger is a good swimmer, but a very poor climber. · They may be slow runners, but they are stealthy enough to catch any prey in their sights. Because they are solitary animals, they mostly hunt at night. · The other four sub-species of tiger are Siberian, South China, Indochinese, and Sumataran. There are only approximately 5,000 to 7,400 tigers left in the wild. · It is belief that if you are born in the Chinese year of the tiger you are unusually lucky. Let’s hope that some of this luck rubs off on the white tiger before it’s too late. Let's try to protect and preserve their existence on earth. The striking white coat is caused by a double recessive allele in the genetic code, and only turns up naturally about once in every 10,000 births. Amazingly, the Bengal tiger is the only subspecies in which it seems to happen. As beautiful as it may look, life as a white tiger can't be easy when your life depends on being able to hide from and/or sneak up on things. Tigers usually stay in an area from about 10 to 30 square miles where there is enough prey, cover/shelter and water to support them. Territory actually depends on the amount of prey that is available. The more concentrated the prey the smaller an area a tiger needs to survive. White tigers in the wild live to be about 10 to 15 years while tigers in zoos usually live between 16 and 20 years. Tigers do not hunt in social groups like lions. They are generally solitary animals. In the wild, tigers will eat pig, cattle and deer. They can eat as much as 40 pounds of meat at one time! After such a big meal a tiger will not eat again for several days. White Tigers have 30 large teeth ranging from 2.5 to 3 inches. Tigers are generally solitary animals, except when caring for their young. Tigers keep their young with them for 2 or 3 years until the young tigers can fend for themselves. In it's natural environment, the White Tiger has no predators due to the fact that it is such a big and powerful animal itself. They are however severely affected by people and have been for hundreds of years, as they have been both captured and hunted for their beauty, and have lost a significant chunk of their historical range to deforestation for both growing Human settlements and agriculture. With the loss in forest, there is also a decline in the White Tiger's prey so populations are becoming increasingly harder to sustain. The fact that the few Bengal Tigers that remain in the wild are becoming more and more isolated means that there is less of a chance that White Tigers will be produced, and this coupled with the severe declines in population numbers could mean that White Tigers have disappeared from the wild forever. Since they were first brought into captivity, White Tigers have been interbred by Humans in a business that is morally questionable and purely profit based. Since then, this already rare animal is thought to have disappeared completely as there have been no confirmed White Tiger reports since the mid 1900s. Although it is simply a question of two gene carrying individuals mating, the fact that people have hunted them and taken over much of their natural habitat, means that the chances of this happening are not very high. There is an issue however, with increasing instances of Bengal Tigers actually entering Human settlements which cause problems between the Tiger and the villagers. Due to the fact that Tigers are becoming increasingly more vulnerable animals, it is illegal to shoot them and so they often return to the same village night after night. The White Tiger is a Bengal Tiger which is a species listed by the IUCN as Endangered and therefore severely threatened in it's surrounding environment. Estimates of around 100,000 Tigers found in the jungles and mangrove swamps of Asia were made at the beginning of the 1900s, but today there are thought to be less than 8,000 Tigers in the wild, with around 2,000 of these being Bengal Tigers. There are no White Tiger individuals known to be found outside of captivity.